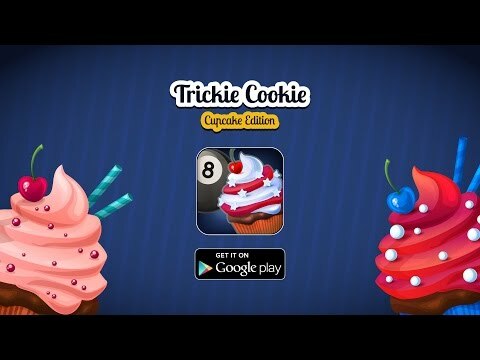 You perform trick shots with billiard balls and other props in order to drop one or more cupcakes in a glass bowl. This entertaining puzzle game with incredible life-like physics simulation is a combination between creating "Rube Goldberg" contraptions and playing artistic pool. You can solve any level in unlikely or impossible ways and show significant skill by collecting all the stars. 1st - The Planning Mode ― you get the level objects from the toolbox and you place and rotate them as you see fit. 2nd - The Play Mode ― by pressing the Play button the game will come to life. Use various objects and the laws of classical physics to complete each level. The first 3 levels will teach you how to play the game and how the basic concepts are working. The more you progress the more freedom the levels will provide, many levels can be solved in different ways. Take a break and solve some challenging puzzles. It’s easy and fun! • Over 120 Different Items: balls, boxes, platforms, trampolines, balloons, books and more! • Solutions for all levels. (You can buy hints, or even skip a level or two).